I should have posted this weeks ago, but all the dates for Summer 2017 are sold out! It’s ‘possible’ a date might open, but I wouldn’t count on it. Right now I’m running three different shows (actually 4). I’m doing my Magical Builder Show at Libraries, and The Very Puzzling Magic Show & The Magic Spy Show at Summer Camps. 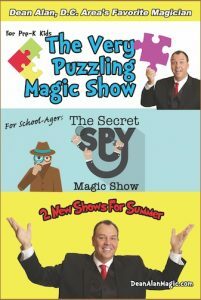 The fourth show is the ‘mixture’ show where I might include material from Puzzling & Spy in one program because it’s a group of mixed ages. Right now the stand-out trick is The Magic Bean trick for the younger crowd, and the stand out routine for the older kids is probably my opening Rope routine which defies explanation. It’s one of those things that you watch and think to yourself, “this can’t be happening”. I chose it because it’s so visual, and it’s played well at all the gigs so far. Right now I have presented about 30 shows so I have around 100 left to go!!!! July 6, 2017 in Blog. ← The Seuss Tour Another Great Success!